Roaches become a nightmare once they enter your home. Don’t let them make their way in and avoid the countless frustration and problems they bring with them. These guidelines will show you how to prevent roaches from entering your home. The best way to keep them out is to not alert them in the first place. Roaches will try to enter your home if they smell food. That includes your trash. These pests aren’t picky about what they eat. Don’t let them smell it and they won’t be tempted to enter. I’ve already covered this in detail in my other post. Check it out if you haven’t yet. Close up all openings they can use to enter your home. If the door is left wide open, they will definitely invite themselves in. I’ll be honest and say that attempting to seal up every opening they can enter through is almost impossible. You’ll likely miss something even if you think you’ve gotten them all. It’s like trying to lock hundreds of doors at once. Don’t let that deter you though. Even if you can’t get all of them, you can still seal most of them. Pipes, wires, etc. that either run from inside to the outside or those that run from the outside to the inside. 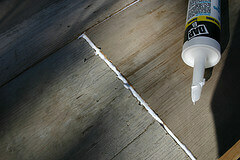 Caulk and silicone are great for sealing up door and window trims. Doors and windows do not fit perfectly and there are always small gaps between the window/door frame and the frame built into the house. That’s why we have trims. The trim’s purpose is to cover up those ugly gaps and imperfections. Most trims are installed with nails, so there are always gaps for roaches to squeeze through. Using caulk, or silicone we can seal the area around the trim. Just doing the inside should be sufficient. However, you can also choose to do the outside too. Just make sure what you’re using is rated for outdoor use. Read the label carefully when you go buy it. A little trick to getting a nice smooth caulk/silicone application is to use a bowl of warm soapy water. Dip your finger into the water and then smooth it out with your finger. You can also seal small cracks using the same method, but I recommend expanding foam instead. It comes in a can with a thin applicator straw. Just stick the straw into the crack, press down on the spray button, and liquid foam will quickly come out. It will expand and dry quickly. This makes it great for sealing up areas where there are pipes, etc. running through the house. A place to check for this is the pipe where you hook up the garden hose. Where the power lines run into the house should already be sealed. Please be very careful if you want to check out this area. Being careless can result in serious injuries and even death. For vents and drains, you will need to find some sort of fine mesh screen to cover them. Head down to your local home improvement store and ask if there are some premade covers of some sort. If you can’t find anything, you may have to get creative and make your own. Check your doors to make sure there is weather stripping installed. Newer doors should have them. If yours does not, you will want to consider adding it to your doors to reduce the number of spaces roaches can enter through. Another way to prevent roaches from entering your house is to create a chemical barrier around it. The benefit of using a chemical barrier is that it will kill most pests and bugs that come into contact with it. The drawback to this is that you must re-spray the house every month to maintain keep it up. A man-made pesticide like Cypermethrin (Demon WP is a popular one) is ideal for this purpose. Just get a sprayer and the concentrate. Mix it with water into the sprayer and spray where the wall meets the ground. Also spray the potential points of entry mentioned above. Do your best to not skip any spots. The longer you wait between applications, the less potent the chemical becomes. In summary, the basics of these guidelines are to not alert them, close all “doors”, and create a barrier. You can choose to just use one or two of them. The choice is yours and you need to consider if the effort and the costs involved are worth it for you. Although using all three of these guidelines on how to prevent roaches from entering your home will get the best results. Also keep in mind that these guidelines are to help keep them out and will not do anything to get rid of those who have already settled into your home. To remove those, follow one of the many effective treatments covered here about how to get rid of cockroaches.